What is Lay in Apparel Cutting Room? Lay: In bulk cutting, a number of fabric plies are laid on the cutting table. The whole number of fabric plies that is spread on the table and cut at a time is called as lay. A 'lay' is also called as 'cut'. A unique number is given to each lay. A lay can be made by any number of fabric layers. It may be a single layer or 20 layers or 100 plus layers. A lay is shown in the following image. On the top of the marker is made using paper pattern in case manual marker making. In this article, I have also explained other terms related to lay. 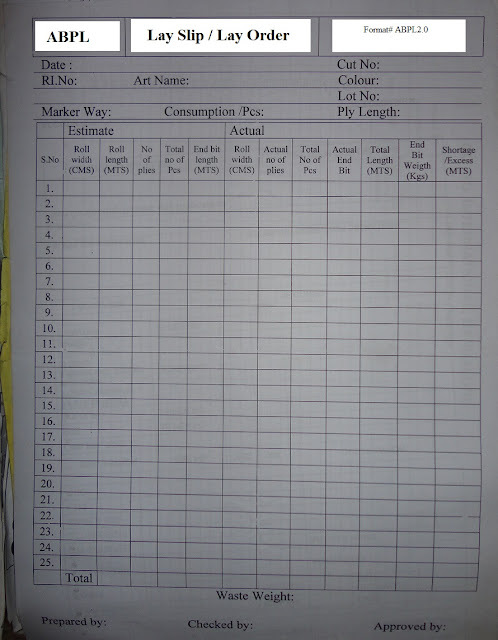 Lay slip: A format or slip used to record lay details is known as lay slip. Lay slip is also known as lay order. In the lay slip normally records, such as the number of each lay, lay length, a number of fabric plies, a number of markers and number of plies spread from each fabric roll etc. are recorded. Later the fabric left out such as end bits, and end loss is calculated using lay slip data. Spreading time to make a particular lay can be also calculated from the lay slip (provided spreader record spreading start time and spreading time of each fabric roll. An example of 'lay order' is shown in the following image. Layer: In the lay, each fabric ply is called as a layer. Lay length: The length of the fabric ply in a lay is called as la length. The lay length is planned according to the marker length. Lay height: After complete spreading of the fabric, we got a certain height of the lay. Lay height is maintained while fabrics are spread on the table to allow the cutting machine to cut the fabric. Lay height may vary depending on the cutting machines. Secondly, the number of fabric plies on a lay depend on the fabric thickness. Online Clothing Study: What is Lay in Apparel Cutting Room? Lay, a cutting room term, and other term related like lay slip, lay number, lay height and lay length are explained in this post.